Celebration will be the order of the day for the Unity Labour Party (ULP) when they meet for their annual convention this Sunday, but General Secretary Julian Francis says that the celebratory mood will not retard the party’s focus on 2010. Francis is aware of the unpredictable nature of the Vincentian political arena and is determined to keep the party on guard. Less challenging however should be finding a replacement for the illustrious Sir Louis Straker, who after four consecutive terms in office has indicated that he will not contest the next general elections. “It is my job as General Secretary to make sure that we are always in election mode,” Francis told SEARCHLIGHT recently. The convention’s theme bears true to Francis’s posture, it reads: “Holding steady to the commitments made”. Be that as it may though, from last night’s scheduled rally at Unity Square to Sunday’s festive convention at the St Joseph’s Convent in Marriaqua, there will be no stopping the ULP from revelling in the sweetness of victory. 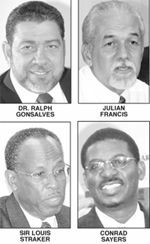 The convention’s morning session is expected to be laced with speeches from Chairman Edwin Snagg, Deputy Political Leader Sir Louis Straker and Political Leader Dr Ralph Gonsalves. A guest speaker is also expected but at press time his or her identity could not be confirmed. As for the elections in the evening, when SEARCHLIGHT spoke to Francis the deadline for nominations had passed, and no new name was in the “election hat”. Large and in charge, with no challenger in sight, Prime Minister Gonsalves is expected to be in high gear. Some more appetite whetting insights into his budget presentation scheduled to be delivered in the house on Monday, December 11 are expected. He will also list the accomplishments to the party faithful, reminding them “as if they need reminding”, why they made the right choice last year. The convention will not be all that festive however as there will be a moment of silence in memory of the passing of Glenn Ian Jackson. The smiling face and uncoordinated gigs of the former prime minister’s personal aide that announced the arrival of “De Comrade” to the podium will not be there this year.